When it comes to protecting your eyesight, it’s important to know that your diet can help play a role in healthy vision. Two helpful nutrients to include in your snacks and meals are beta-carotene and lutein – both of which are abundant in spinach and carrots, the main ingredients in this tasty juice recipe. You'll also need some acerola cherry powder, a powerful and delicious antioxidant-rich food that's available in most natural food stores. This powder can prevent free-radical damage in your eyes, as well as protect the visual cortex of your brain. The process of juicing extracts liquid from fresh fruits and vegetables. Stripping away most of the solid matter, including seeds and pulp, from whole fruits and vegetables, results in a beverage that contains vitamins, minerals, and antioxidants naturally present in the produce. Juicing is generally conducted for cleansing or detox purposes (when solid food is eliminated and the remaining juice is consumed as a way to cleanse your body of toxins for three days to several weeks at a time) and to supplement a normal diet by increasing nutrient intake from fruits and vegetables that you wouldn’t otherwise consume. Juicing methods vary, from squeezing fruit by hand to the more commonly used powerful motor-driven juicers. Centrifugal juicers grind produce into liquid and pulp by spinning at high speeds. Cold-press juicers, or masticating juicers, crush and press fruits and vegetables slowly to get as much pure liquid as possible. Cold-press juicers don’t produce heat, so they do not cause the breakdown of beneficial enzymes and nutrients that are thought to happen with centrifugal juicers. 1. 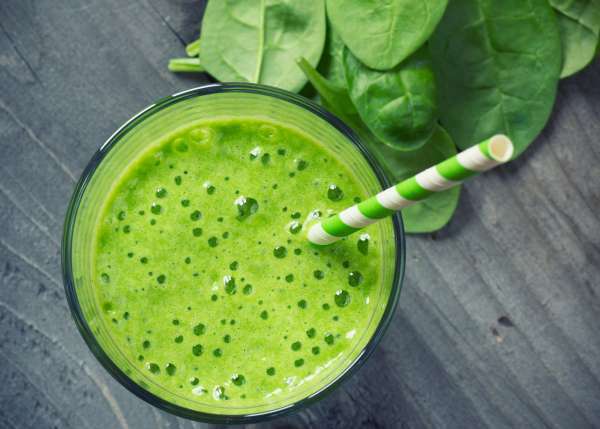 Using a juicer or blender, juice the spinach, apple, and carrots together. 2. Stir the cherry powder into the juice.